Dwarf navel orange trees can be grown outdoors where there is not much room in the landscape or grown in containers. When purchasing the tree, look for dwarf or true dwarf on the label. These trees have been specially grafted on a dwarf rootstock to keep the tree small. The Washington navel orange tree is the most popular navel in both full-size and dwarf trees. The care for full-size and dwarf trees is the same with the exception that container trees need to watered and fertilized more often than trees grown in the ground. Locate container trees in full sun, preferably on the south side of your house or outbuilding. This will protect the tree from freezing or damaging winds. Water newly planted trees twice a week if they are in the ground. Container trees should be watered at least every other day unless it is very hot and dry, in which case they will need more water. Water the tree if the soil next to the tree is dry to 2 inches. Do not water if there has been adequate rainfall. Irrigate once a week if there is no rain after the initial two week period, or twice a week for container trees. During the second growing season, trees in the ground will only need to be watered if there has been no rain for at least two weeks. Container trees should be watered once a week throughout the growing season (more if there are drought conditions). Keep weeds from growing 3 feet from the trunk of the tree in every direction. Hand pick weeds from containers and use a contact herbicide on the soil around trees in the ground. Do not allow the herbicide to touch the trunk of the tree. Young citrus trees cannot compete with lawn grass or weeds for moisture and nutrition. 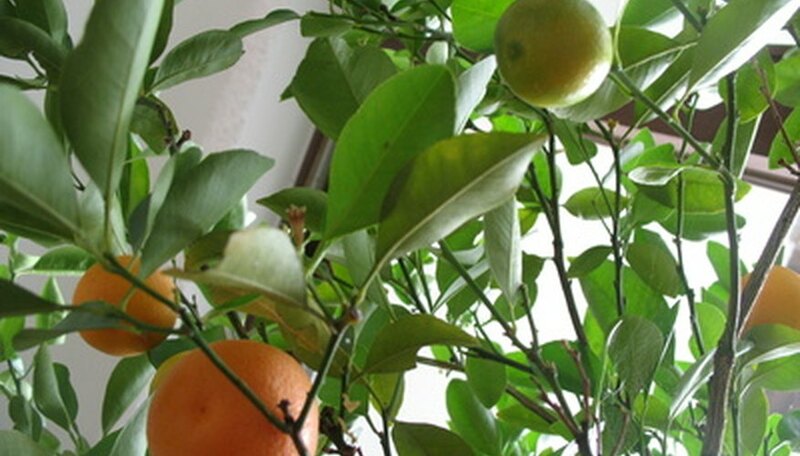 Apply a fertilizer made for citrus trees in April, May, June and July. Follow the manufacturer’s directions for how much to apply per age and size of the tree. Prune off dead, damaged or diseased branches at any time. Citrus trees do not normally need to be pruned for shape, but if a branch is totally out of place, you can cut it back. Cut off all suckers or branches coming from below the graft line. The fruits of the dwarf navel orange are the same size as traditional oranges; only the tree is smaller.